Prom season is back! Along with Prom season, weddings are going to be on and popping as well. It’s time to start preparing. 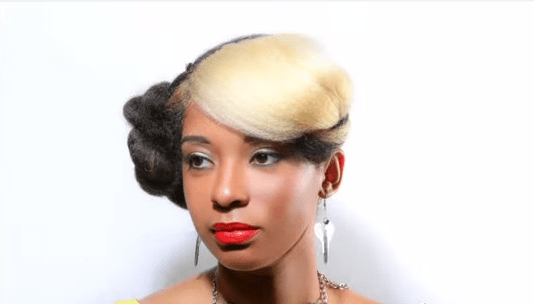 Here are some styles that embrace the beauty of natural hair while also giving you that elegance that you need for formal and special occasions. This video has three lovely formal hairstyles wrapped into one. At the 3:30 mark the first tutorial for a big lovely intricate side bun is shown. The style of the bun and the side swept bang serve as embellishments on their own, so you only need very minimal if any hair accessories. At 7:07 we have a classic retro updo filled with volume and a french roll in the back. This is perfect for a glam look, it almost reminds of me of old Hollywood! To add a final finishing touch, you can add a tiara or sparkly hair accessory to further accentuate your style. The final style showcased at the 10:15 mark is a high twisted bun with a sleek gorgeous style that is perfect for the prom. All these styles will work best on stretched out moisturized hair. This style has to be the more simplistic style out of the 3 tutorials from SimplyCre8eve’s video tutorial but it’s also my favorite. It’s also probably the easiest to achieve, if you are looking to do your hair on your own for prom. Two high ponytails are created for more fullness and you simply loosely twist then pin your hair away. This style will also work well with hair accessories and tiaras.